Those words have echoed the halls of offices everywhere for the past few years — because they’re true. In fact, 97% of employees and executives believe lack of alignment within a team impacts the outcome of a task or project. As a result, companies are knocking down cubicles and creating common spaces for employees to connect and work through tasks together. We’ve seen this to be especially true with marketing companies, like ours, that rely on a diverse set of skills from a team of people to complete a single project. But what if your workplace is 100% virtual? It’s not as easy to gather everyone together in a group when they’re spread out across the country, or even the world. Social Tribe knows a thing or two about this. As a completely virtual company that is also growing quickly, we are constantly looking for ways to scale our work in a collaborative and strategic way. Let me give you some insight into how we do it. In my year and a half of working in content marketing for a virtual company, I have learned that content calendar management is only as good as the tools you use to manage it. 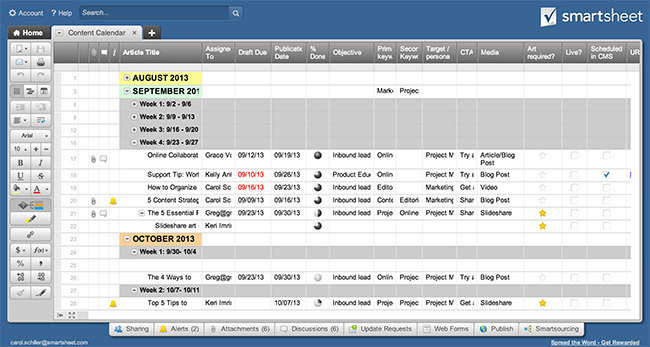 For us, the tool we use to manage our editorial calendar is Smartsheet. For you, it might be something different, but we are big fans of Smartsheet because it was designed to be a fully collaborative tool. Think of it as Excel spreadsheets but with more capabilities and functionalities, all living in the cloud. Everyone on your team has full transparency into where a project stands (complete with status buttons and color-coding galore) and what actions are needed to get it to the finish line. Think ahead – what topics / themes are coming up over the next few months? Add those to your editorial calendar and assign a publish date to them well in advance. Our goal is to build up a content library each quarter, and publish least one piece per week so we aren’t scrambling week-to-week to get something out. Headcount — how many people are needed to complete this piece of content? If you know you need a writer, a designer, and an SEO specialist, make sure you include all of them and their respective tasks and due dates in the process. Accountability — Create a checklist for each task and hold everyone accountable for checking off their to-do lists before the due date. For example, my colleague Emily is an expert in data and reporting, because that’s a big part of her job and she’s a rockstar at it. So when we have a blog topic in the calendar that talks about measuring success using data and reporting, she’s the first person I’ll turn to for insights and collaboration. And so on. Keeping a robust library of content will help you manage content production without having to reinvent the wheel. Are you a growing or virtual business? How do you scale your content production? We want to hear about it! Please leave a note in the comments. If you are interested in contributing to our blog, please fill out a form on the Contact page. We’d love to hear from you!